Meandering through life, one good eat at a time. The story started in San Diego, headed to Omaha, then Phoenix, and now a new chapter in Los Angeles. Want to know more about me? 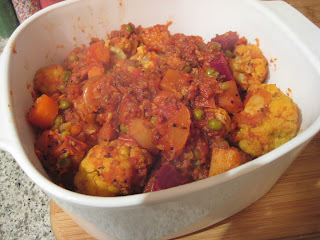 Many thanks to Indira of Mahanandi for a fantastic aloo gobhi recipe. 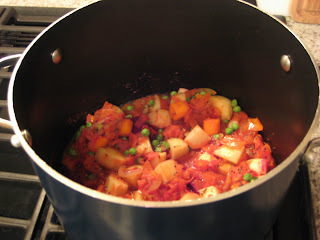 Curries/stews are a great way to put CSA veggies to good use, so I decided to vary the ingredients a little bit. 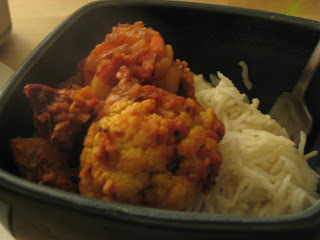 Aloo gobhi (or gobi) literally means "potato cauliflower". Since cauliflower was in the last CSA box, I thought this would be the perfect dish to use it in. 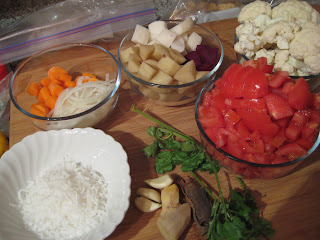 I was working late, so D. had the mise en place done by the time I arrived home. The only omission were the spices, because we didn't want turmeric flying all around the kitchen. We added a beet and a turnip to the recipe's ingredients. 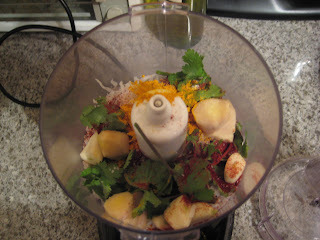 It starts with the tadka, or tempering, of spices and aromatics. Tomatoes are added and cooked down. The root vegetables are added and cooked, covered, until they soften. This happened surprisingly quickly. The beets made a lovely almost-magenta hue. 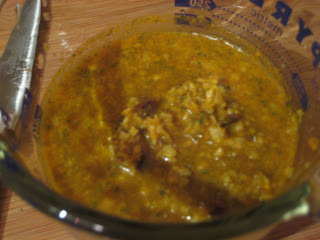 While the veggies were cooking down, D. went to work on the masala paste. The ingredients were pulsed with water to form the paste. The paste is added along with the cauliflower. Once everything is soft, the dish is ready to serve. My own twist to this was using chicken broth to add more moisture. The liquid was rapidly cooking away and I needed to replace it or have a burned mess on my hands. 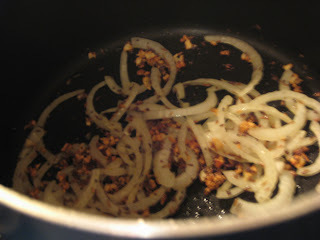 Aloo gobhi is not supposed to have much of a liquid sauce, hence the concern about drying out and burning. 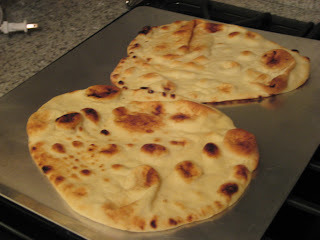 Served it with store-bought naan. Travesty, maybe, but hey, I don't own a tandoori oven. It was awesome. I can't wait to try Indira's palak paneer recipe, which is my favorite Indian dish. I hope the CSA box has spinach soon. Sounds delicious! The beet really gave it a nice color. I went to a vegetarian Indian cooking class wednesday night and we learned a delicious cauliflower curry...the sauce had a base of onion, cashew and cilantro. It was delicious! One of these days I'll get around to making, photographing, and posting the recipe along with some of the other dishes we learned. My awesome (former) food writing gig! Meandering Eats is licensed under a Creative Commons Attribution-NonCommercial-NoDerivs 3.0 Unported License.